Oak Street Manufacturing two sided round tabletop. Our most popular item, the quick ship two sided table top is completely reversible to adapt to any decorating style. This 24-inch round table top is constructed of 1-inch thick, 45 pound industrial grade particle board. 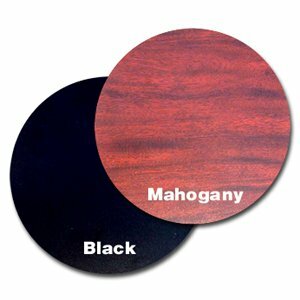 The completely reversible top features mahogany or black thermally fused melamine on either side and is edged with high quality extruded rubber t-mold. The table tops are boxed separately and do not include the table base. These tops are California CARB-Compliant Phase 2. If you have any questions about this product by Oak Street Manufacturing, contact us by completing and submitting the form below. If you are looking for a specif part number, please include it with your message.